Pork pochero is a tomato based stew cooked with vegetables such as sting beans, cabbage, pechay, garbanzos or chick peas, potatoes and of course, the saba bananas which makes it distinct with other Filipino tomato based dish. It is also more soupy compared to other tomato based pork stew. 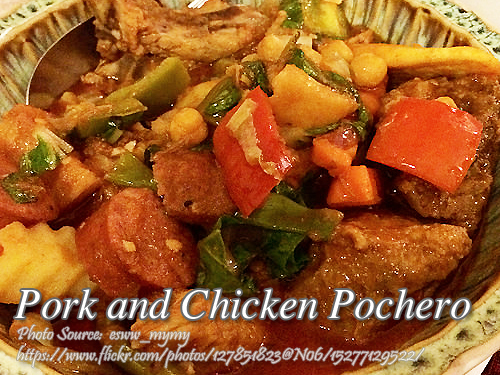 Pochero also has variations with regards to the meat used in cooking like beef or chicken. This pork pochero dish although pork is the main meat ingredient, it is also combined with a little bit of chicken meat. It’s up to you to omit the chicken if you want only the pork pochero. To cook pork and chicken pochero; In a medium saucepan, boil pork and chicken in water with spring onions and salt until tender. Drain meats and reserve broth. Heat oil and sauté garlic and onion until soft. Add the meats and chorizo de bilbao. Stir-fry. Pour the broth and bring to a boil. Lower heat and simmer for 20 minutes. Add the potatoes, bananas and garbanzos. Simmer for 15 minutes or until potatoes are tender. Pour tomato sauce. Add cabbage and continue simmering for a few minutes. To see the complete recipe with list of ingredients, continue reading. Pork pochero is a tomato based stew cooked with vegetables such as sting beans, cabbage, pechay, garbanzos or chick peas, potatoes and of course, the saba bananas which makes it distinct with other Filipino tomato based dish. In a medium saucepan, boil pork and chicken in water with spring onions and salt until tender. Drain meats and reserve broth. Heat oil and sauté garlic and onion until soft. Add the meats and chorizo de bilbao. Stir-fry. Pour the broth and bring to a boil. Lower heat and simmer for 20 minutes. Add the potatoes, bananas and garbanzos. Pour tomato sauce. Add cabbage and continue simmering for a few minutes. If desired, stir in milk. Serve hot with eggplant sauce(search this site). Serves 8.
thank you for the recipes. i am learning a lot from them! Hi Maria, I’m glad that this blog is helpful to you. Cheers! thank you so much for featuring all kind of filipino recipes now i could cook and shared to our friends. Hi Tess, you are welcome!